Veterinary rehabilitation aims to treat pet injuries and illness by decreasing pain and restoring normal function. This is accomplished by trained professionals through the use of rehab equipment, complementary modalities, and therapeutic exercises. 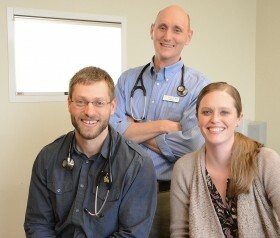 Veterinary rehabilitation was pioneered by a group of veterinarians and human physical therapists over 15 years ago. It has since thrived and gained traction as a significant treatment option available to pets. 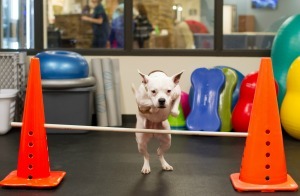 Rehabilitation can be especially beneficial to a variety of patients: whether they are recovering from surgery, involved with competitive agility training or are in need of ongoing supportive care for chronic or degenerative diseases. Members of the rehabilitation team at Upstate Veterinary Specialties in Latham have completed the necessary training and are certified through the Canine Rehabilitation Institute (CRI), a leading veterinary rehabilitation institute. 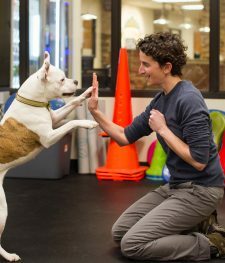 Our certified rehabilitation team will work closely with you and your pet to ensure they receive the best possible care. 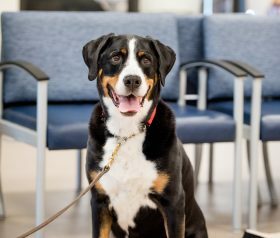 Our rehabilitation program director, Dr. Laura Perez and Jennifer Wolfe, rehab technician, will meet with you and your pet to develop a customized program that will assist your pet during their recovery, while ensuring your pet’s pain is well controlled. They will design both an in-hospital program as well as an outpatient program so that recovery continues at home. Pet owners are free to stay with their pets for the duration of their session. If pet owners have a busy schedule and would prefer to drop their pets off for their session, they are welcome to and can pick them up at the end of the day! If your pet is in need of rehabilitation services, speak with your primary care veterinarian about a referral to Upstate Veterinary Specialties in Latham NY. Our Veterinary Rehabilitation Specialists and the team at UVS will work with you and your veterinarian to provide the best possible care for your animal companion. 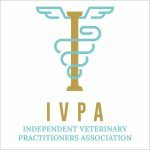 If you’re a referring veterinarian seeking more information about the rehabilitation services and treatments available for your patients at Upstate Veterinary Specialties, contact us today at (518) 783-3198. To refer a patient, use our quick and easy Online Referral Form.